Expose 1 card installed in a remote server. Trash that card at no cost if it is an asset or upgrade. Drive by has been impressing me lately, this is a very powerful and versatile card. It serves several real needs for the criminal runner. Even if the corp isn't running ambushes, the Drive By can make its slots back by smashing upgrades. When the corp IAA's a card in a server with an agenda, the runner must ask themselves if that is Caprice Nisei or Ash 2X3ZB9CY, or even Marcus Batty. Any of these can make the run into a misery. But with a drive by, all of a sudden you just have to fight the ice to make the steal. If the corp isn't doing ambushes or upgrades, perhaps they are using an asset based economy? It is important to remember that the trashing effect of Drive By happens with no cost. The corp usually waits till the appropriate time to rez their assets. Preempt that with a Drive By and you can save yourself a lot of money on that SanSan City Grid or other expensive to trash asset. Obviously, the Corp can render 2 and 3 less viable by rezzing their assets or upgrades immediately, but the runner is not unhappy if they go down that route. Knowing exactly what's out there is an advantage that it is tough to put a price on, and since the corp is spending money to rez these assets/upgrades, they will be less able to rez their ice. 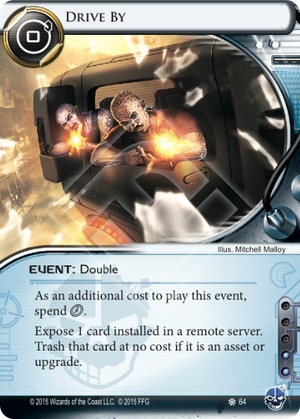 This is a card that competes strongly with the other fantastic criminal run events. Many decks will benefit from including Drive By. This seems like a very powerful card, with the minor drawback that only unrezzed cards can be exposed. However, the Corp can't rez a card "in response" to Drive By, so if they think you are packing it, they have to rez their card in advance and give you free information. For example, a PAD Campaign or a Jackson Howard that is usually rezzed right before it is needed, or an ambush such as a Cerebral Overwriter that is protecting a Shell Corporation - if the Corp player forgets about the existence of Drive By, you can trash both cards by making a run after driving by, costing them heaps of credits. One of the cards that this will be best against is Ronin since the usual Corp strategy of protecting it is to make you think that it could be an ambush. If you use Infiltration and discover an ambush, you have saved one click compared to using Drive By, but if you find a Ronin then you would have to make a run on that server and pay the trash cost, whereas Drive By would save you all that trouble. It works well against any other cards that the Corp would usually like to keep face down yet aren't negated merely by being exposed... some examples are Corporate Troubleshooter or Thomas Haas with advancement tokens on him.